Richard Easther, Head of the Physics Department at the University of Auckland, has been asking questions about the universe for more than 20 years. He’s uncovered just as many new questions as answers in that time, but he and colleagues at Auckland and the University of Canterbury, along with a number of international collaborators, used NeSI resources to shed some potential new light on a dark part of the evolution of the universe. What happened in the seconds following the Big Bang remains a source of many hypotheses and unanswered questions. 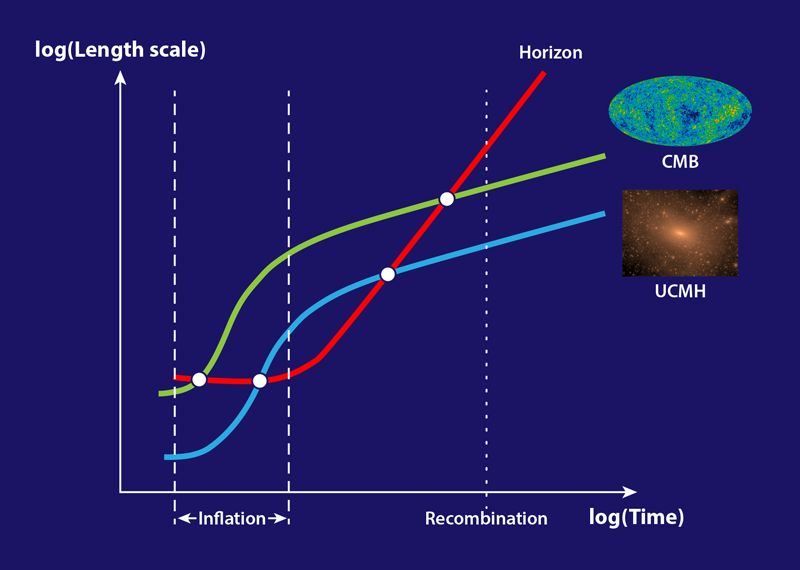 In particular, researchers propose there was a period of accelerated expansion, called inflation, just after the Big Bang during which the universe expanded dramatically, before settling into a slower state of expansion. To better understand what happened during that initial inflationary period, a research team including Easther, Grigor Aslanyan, and Layne C. Price from Auckland, and Jenni Adams from Canterbury, looked closely at the connections between the physics of inflation and the existence of ultracompact minihalos (UCMHs) – small dense clouds of dark matter that could form soon after the Big Bang. Scientists believe that dark matter acts like supporting infrastructure or a skeleton for the universe, providing the extra gravitational force necessary to hold galaxies together and bind them to others. However, scientists have no idea what the dark matter is actually made of, and this poses a deep challenge for both particle physics and astronomy. There are many competing ideas about what dark matter might be, and not all of them predict the existence of UCMHs. Consequently, finding UCMHs would shed light on the nature of dark matter while revealing information about the universe soon after the Big Bang, similar to the way animal and plant fossils can provide us with information about the earth’s conditions in earlier geological times. What is turning heads about this recent work is the connection it makes between the distribution of UCMHs and inflation, providing information to help develop, or maybe completely rule out, some existing inflationary models while refining our understanding of how and when we would expect minihalos to form. Space.com published an article on this work, and it was also highlighted as an Editor’s Suggestion in the Physical Review Letters (PRL) journal. The simulations that led to these key insights were run on NeSI’s high performance computing systems. Next, Easther’s group is looking at ways in which newly released astrophysical data can further constrain models of inflation and NeSI’s platforms and services will play an important role in that project as well. “NeSI’s resources makes it possible for New Zealand based scientists to do work at the forefront of modern cosmology,” he says.